This mani is another one that I did for the A-Z Nail Art Challenge. And I’m filing this one under H – Holo. 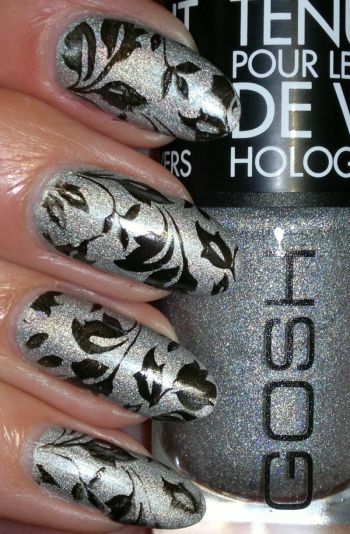 For this mani I painted my nails with Gosh 549 Holographic Hero (2 coats). This holo polish is not great, but holo polishes aren’t readily available in the UK, so I’m actually happy to have this one (and several back-up bottles) in my stash. I think this mani looks quite nice. Do you agree? Feel free to comment. And thanks for reading! Hi there! Today’s post is another nail post. I didn’t know what to do with my nails the other day (What else is new…?!). I wasn’t in the mood for bold colours, pastels or glitter. So in the end I decided to paint my nails with Gosh 549 Holographic Hero (2 coats). I really like this polish. It dries quickly and it looks very pretty. Sure, it would look even prettier on a sunny day, but it’s winter, and (unfortunately) there’s nothing I can do about the weather. 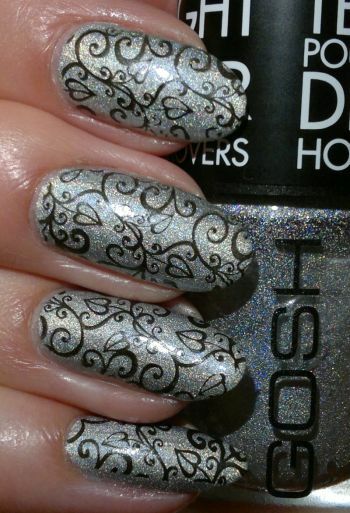 And I didn’t have the time or energy to think up a complicated mani, so I went for a super easy stamping mani. The floral images are from Pueen’s 72 plate (which is part of Pueen’s Stamping Buffet collection). And the black polish I stamped with is Revlon Colorstay 270 Stiletto. Hi there! I’ve been sporting really boring manis for the past week. Nothing worth mentioning. And, of course, I got bored of those plain manis. 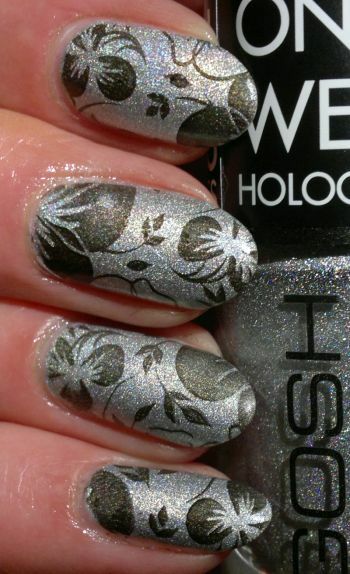 So I grabbed a holo polish, Gosh 549 Holographic Hero, and my stamping kit. I applied two coats of Holographic Hero. The polish dried quickly and was opaque in two coats. It’s not the strongest holo polish out there, but I only paid £1.99 for it, so I won’t complain.